The Showa 660 Oil Resistant Gloves are chemical resistant gloves that seal and protect the hands against chemicals while remaining flexible. 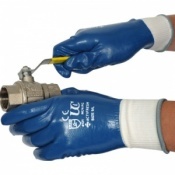 Impermeable, the Showa 660 Oil Resistant gloves are ideal for working in damp or greasy environments, enabling the wearer to grip objects securely. The Showa 660 Oil Resistant feature a seamless cotton lining which is PVC dipped to provide excellent protection against chemicals and oils as well as mechanical hazards. The gloves have the highest resistance to abrasion (level 4) and have an excellent lifetime in comparison to most PVC-dipped gloves. The Showa 660 Oil Resistant Gloves are anatomically designed to maximise flexibility and comfort. 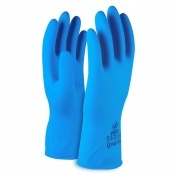 The gloves have a rough finish all over the hand to optimise grip and feature an anti-bacterial cotton liner to offers comfort and absorbs perspiration. The gloves have smooth sleeves which cover the wrists well and are washable in neutral detergent. 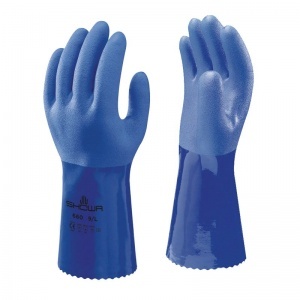 The Showa 660 Oil Resistant Gloves are available in four sizes. Please see the table below for details.